Back from my extended Christmas leave I found a batch of plants waiting for me in the Garden’s reception area (that is where plants accepted into the garden are checked and monitored for pest and diseases). It was the Lonicera nitida for the hedging in my Cottage Garden, donated to the RHS by the lovely folks at nursery best4hedging in support to my potager project (that I mentioned before). I have chosen L. nitida for the Cottage Garden as an alternative to box, as the popularity of such plant and its extensive planting across the country has meant that it has become an easy target for pests and diseases, the two most recent and devastating ones being box blight (caused by fungi Cylindrocladium buxicola and Pseudonectria buxi) and the box tree caterpillar (Cydalima perspectalis). L. nitida is rather dainty with its small light green foliage, but it's vigorous in growth so it is used for hedge and topiary, and it will likely do well in our poor sandy soil, even if it will require clipping back at least 3 times a year; it should feel proportionate for the area in which it is planted. Wilson's honeysuckle, as it is commonly known, comes also in a cultivar called 'Baggesen's Gold' with yellow leaves, that was awarded an AGM, but as green leaves would be more appropriate to the location, I have chosen to plant the species. Given that this plant is relatively free of pests and diseases, I was able to retrieve it from the reception area earlier than I would if it had been Buxus, as monitoring for plants with known problems needs to be carried out for longer*. So today I was able to carry out my planting. 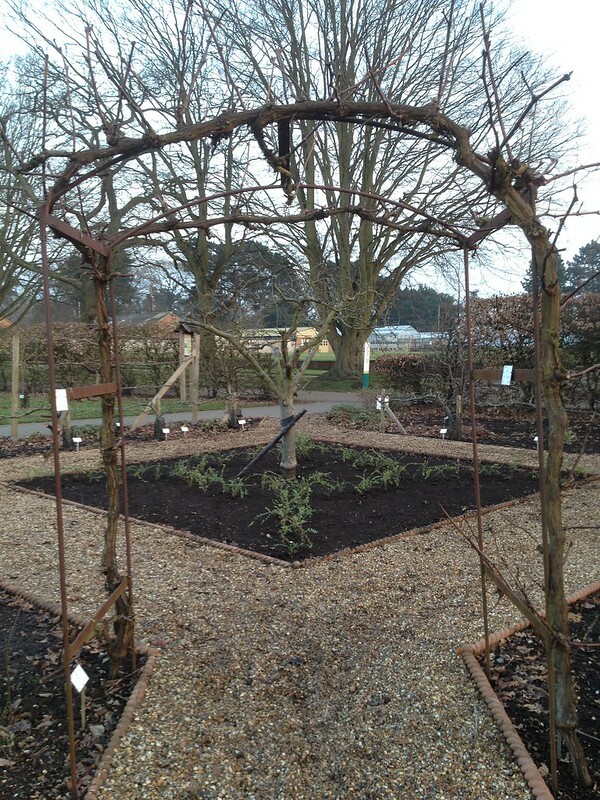 I was a bit nervous, as my design was a bit unusual for a potager. 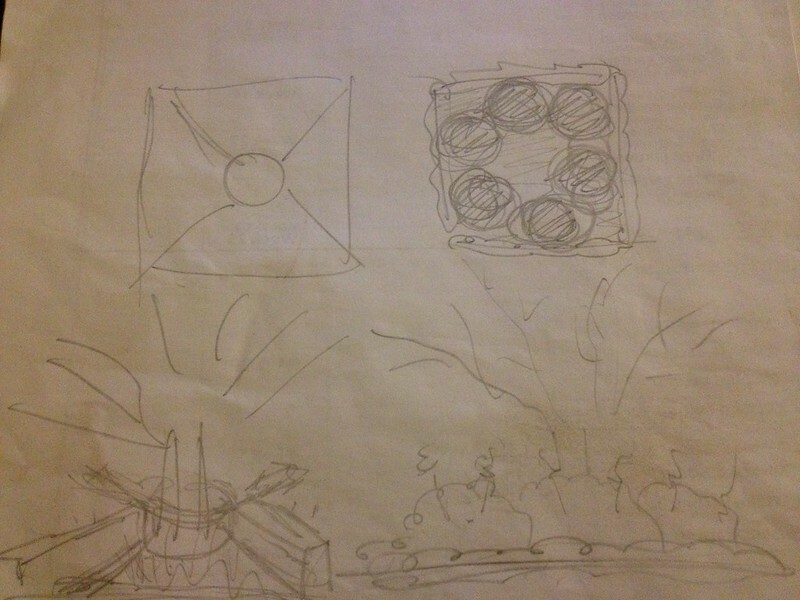 I was going to fill a square bed that is already delimited by clay rope edging and decided not to plant along the perimeter, but to create a circle in the middle (around an existing apple tree) and "spokes" from the circle to the square's corners. As the paths into the Cottage Garden approach the square bed from the corners, I thought planting along the perimeter would look like a wall in the face of the visitors, while lines from the corners to the centre would lead the eye on. The Cottage Garden consists of a more formal half (including the square bed) and a more informal area. By choosing to make a potager with a neat, geometrically shaped hedge, I have emphasized its formality. An alternative design I had discussed with a specialist colleague (who sketched it for me) would have been to soften the formal geometric hard landscaping of this half of the Cottage Garden, linking it to the informal area, by using a less structured type of hedging (i.e. Alchemilla mollis) planted in circles. Having made my choice on paper, I was still a bit uneasy about how it might look in practice, so I laid the plants down first thing to have a look at the design in situ. What I saw was encouraging. So, fresh from my training in implementing complex designs, I started measuring and delimiting the area with canes and string. As the apple tree was slightly off centre (it had to be planted with a sling from a truck, as it was full size), with my canes and string I found it easy to adjust the design, by making the circle a little bit smaller. 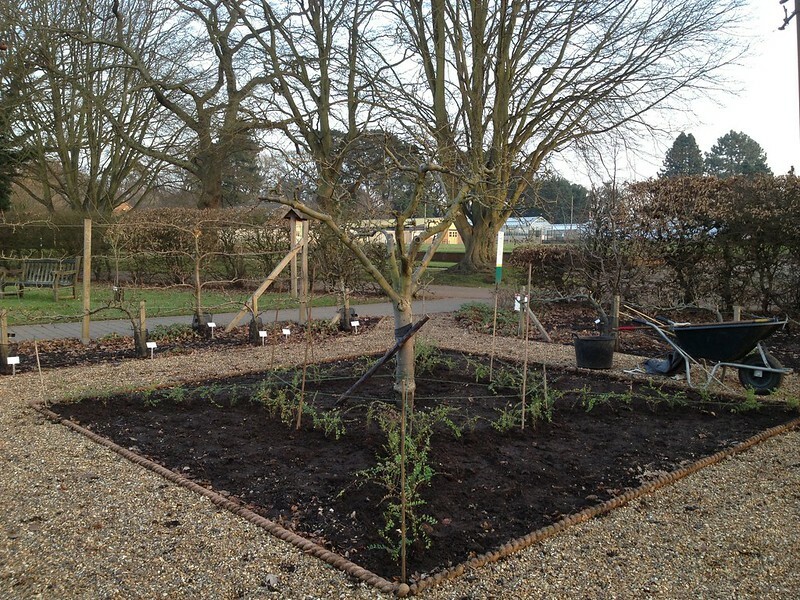 Then I proceeded with planting the Lonicera in two rows, either side of the string, spacing the plants about 20 cm. I was definitely pleased with the results, but wanted to remove all the props before starting to enthuse. A good rake to the soil... and yes, I am really pleased. Two colleagues, a volunteer and a couple of visitors have already fed back they liked it! The feeling is to have come a long way from the first time I worked in my area back in October, clearing the spent meadow from under the apple tree in the square bed! 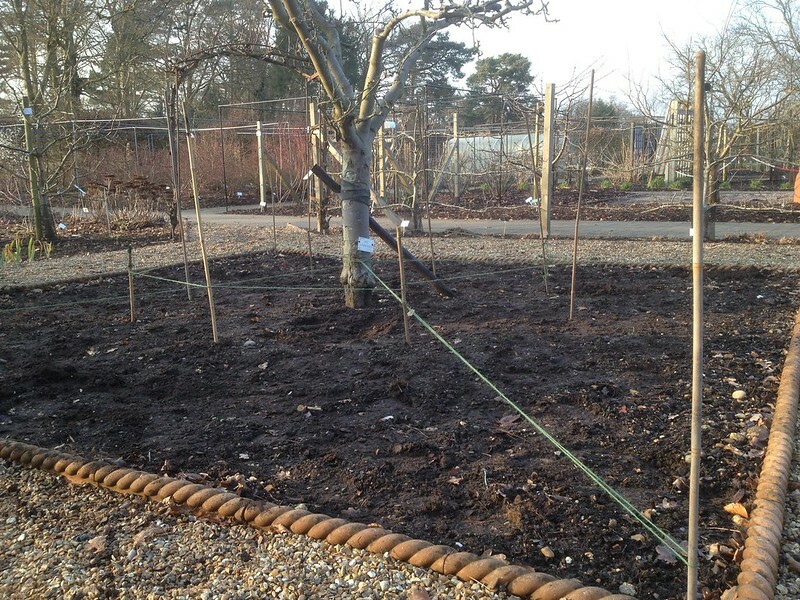 But of course this is just the start: we now have to grow the veg and fruit to fill the newly created divisions in the bed. They are four, by the way, to accomodate a four-year rotation: Solanaceae and Cucurbitaceae, followed by Alliaceae and Papillionaceae, then Brassicaceae and Asteraceae and finishing with Apiaceae and Chenopodiaceae. 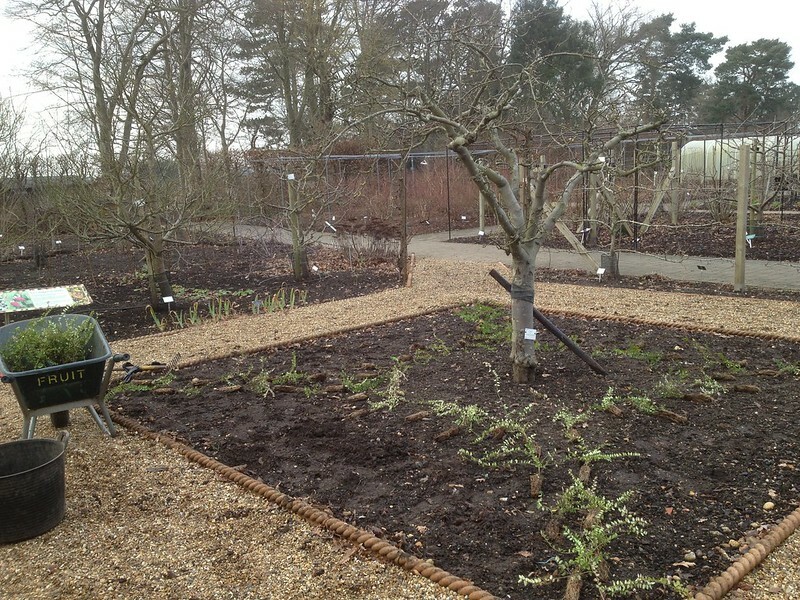 The circle around the apple tree will be mulched and will give the tree roots some space to develop undisturbed. * a note on P&D: if checking on purchased plants, keep in mind that potted plants (as opposed to bare roots, could also harbour some in the soil!